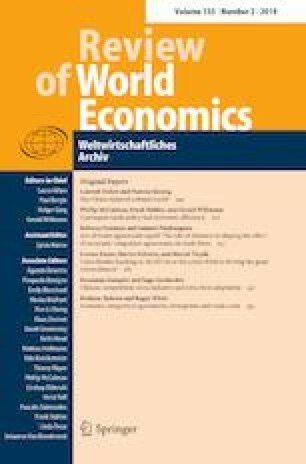 This paper proposes a unique overview of trade policies since 2001, based on detailed data on tariffs and trade covering 130 countries. It shows that regionalism has delivered limited liberalization, representing only a 0.3 percentage point (p.p.) cut in the worldwide average applied tariff between 2001 and 2013. WTO commitments (1.0 p.p. average cut) and unilateral liberalizations on a most-favored-nation basis (1.3 p.p.) mattered far more. The study also shows that GVC participation was a powerful motivation underlying tariff liberalizations, including those carried out at governments’ own initiative. The paper finally assess that recent trade policy changes more than halved the worldwide welfare gains expected from multilateral tariff-cutting. If all PTA negotiations were concluded, gains would fall to one-third of their 2001 level. Bureau and Jean benefited from support by the European Union’s Seventh Framework Programme FP7/2007–2011 under Grant Agreement 290693 Foodsecure. The authors only are responsible for any omissions or deficiencies. Neither the Foodsecure project partner organizations nor any organization of the European Union are accountable for the content of this paper. 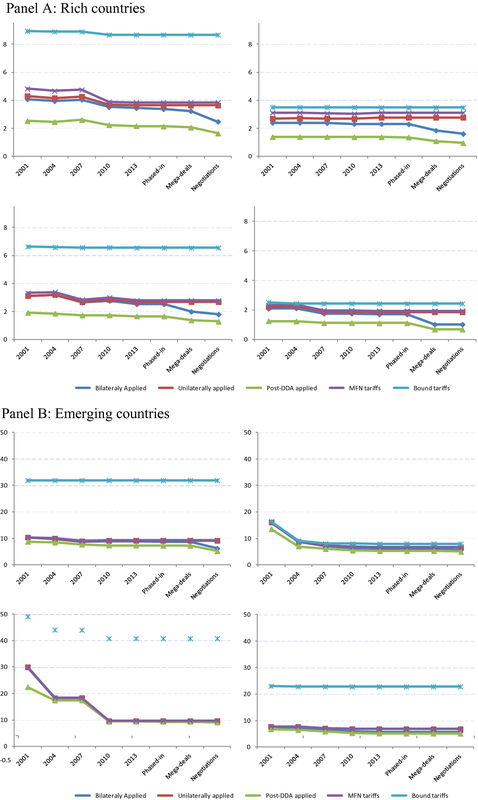 The authors are indebted to Mondher Mimouni and Xavier Pichot for making tariff protection data available to them, and for helpful discussions. They would like to thank the editor Gerald Willmann and two anonymous referees for their valuable suggestions. On the supply side, each sector in Mirage is modeled as a representative firm, which combines value-added and intermediate consumption in fixed shares. Value-added is a CES bundle of imperfectly substitutable primary factors (capital, skilled and unskilled labor, land and natural resources). Firms’ demand for production factors is organized as a CES aggregation of land, natural resources, unskilled labor, and a bundle of the remaining factors. This bundle is a nested CES aggregate of skilled labor and capital (which are considered as relatively more complementary). Mirage assumes full employment of primary factors, of which the growth rates are set exogenously, based on the macro projections on a yearly step, as detailed below. Population, participation in the labor market and human capital evolve in each country (or region of the world economy) according to the demographics embedded in the macro projections. This determines the labor force as well as its skill composition (skilled/unskilled). Skilled and unskilled labor is perfectly mobile across sectors, but immobile between countries. Natural resources are sector-specific, while land is mobile between agricultural sectors. Natural resources for the mining sector and land for agricultural sectors are set at their 2011 levels: prices adjust demand to this fixed supply. In the baseline, natural resources for fossil-fuel production sectors adjust to match the exogenous price target that is imposed (IEA 2015) for coal, oil and gas, and according to the energy demand projected by the model. By contrast, in the simulations, changes in demand for fossil energy sources influence their price, while natural resources are fixed at their baseline level. Installed capital is assumed to be immobile (sector-specific), while investments are allocated across sectors according to their rates of return. The overall stock of capital evolves by combining capital formation and a constant depreciation rate of capital of 6% that is the same as in the long-term growth models. Gross investment is determined by the combination of saving (the saving rate from the growth model, applied to the national income) and the current account. Finally, while total investment is savings-driven, its allocation is determined by the rate of return on investment in the various activities. For simplicity, and because we lack reliable data on foreign direct investment at country of origin, host and sectoral levels, international capital flows only appear through the current account imbalances, and are not explicitly modeled. On the demand side, a representative consumer from each country/region maximizes instantaneous utility under a budget constraint and saves a part of its income, determined by saving rates projected in our first-step exercise. Expenditure is allocated to commodities and services according to a LES–CES (Linear Expenditure System–Constant Elasticity of Substitution) function. This implies that, above a minimum consumption of goods produced by each sector, consumption choices among goods produced by different sectors are made according to a CES function. This representation of preferences is well suited to our purpose as it is flexible enough to deal with countries at different levels of development. Within each sector, goods are differentiated by their origin. A nested CES function allows for a particular status for domestic products according to the usual Armington hypothesis (Armington 1969): consumers’ and firms’ choices are biased towards domestic production, and therefore domestic and foreign goods are imperfectly substitutable, using a CES specification. We use Armington elasticities provided by the GTAP database (Global Trade Analysis Project) and estimated by Hertel et al. (2007). Total demand is built from final consumption, intermediate consumption and investment in capital goods. Efficiency in the use of primary factors and intermediate inputs is based on the combination of four mechanisms. First, agricultural productivity is projected separately, as detailed in Fontagné et al. (2013). Second, energy efficiency computed from the aggregate growth models is imposed on Mirage. Third, a 2 p.p growth difference between TFP in manufactures and services is assumed (as in Van der Mensbrugghe 2005). Fourth, given the agricultural productivity and the relation between productivity in manufacturing and services, Mirage recovers endogenously country-specific TFP from the exogenous GDP and production factors. Notice that TFP thus recovered from the baseline projections is subsequently set as exogenous in the alternative scenarios. Therefore, GDP becomes endogenous in such scenarios. Dynamics in Mirage is implemented in a sequentially recursive way. That is, the equilibrium can be solved successively for each period, given the exogenous variations of GDP, savings, current accounts, active population and skill level coming from the growth models, as described above. Simulations extend up to 2025. Finally, Mirage is calibrated on the GTAP dataset version 9PR1, with 2011 as a base year. Hufbauer, G. C., & DeRosa, D. A. (2007). What do gravity models tell us about PTAs’ impact on trade flows: More creation or more diversion? Vox, CEPR. Available at http://www.voxeu.org/article/free-trade-agreements-and-trade-liberalisation. Accessed 28 Mar 2019.